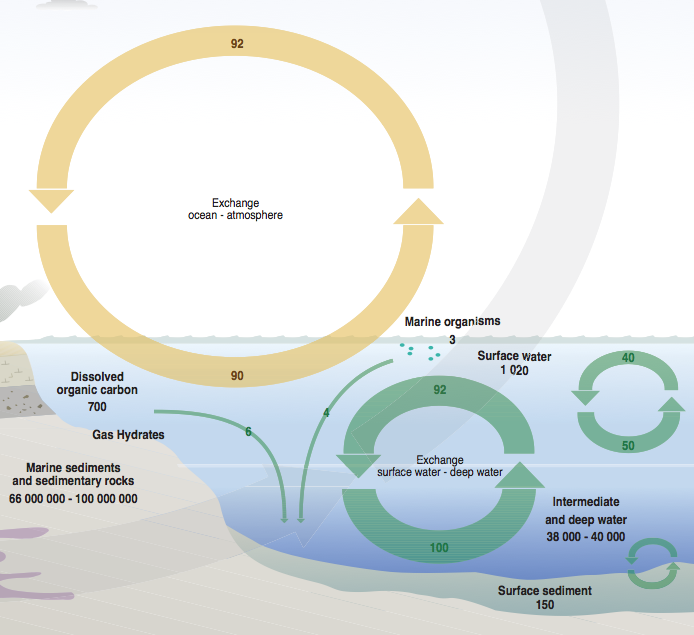 The carbon cycle can be rather confusing as there are at least 3 totally separate processes at play, each occurring on different time scales. Here we show that it is just geological processes that result in a ‘long tail’ as the atmosphere recovers from a doubling of CO2. This long tail is very small and has little long term consequences. Glacial variations are much larger. To understand the carbon cycle means understanding the difference between CO2 residence time and turnover time. The residence time for an individual CO2 molecule emitted by man is only about 5-10 years (C14 measurements). 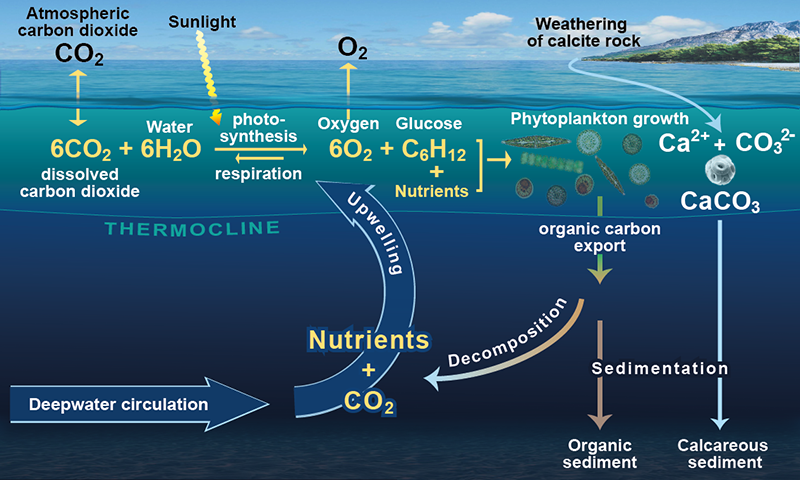 Every CO2 molecule in the atmosphere is rather quickly absorbed either by photosynthesis or by the ocean. However on average most of them are simply replaced by another CO2 molecule entering the atmosphere through evaporation from the ocean or by respiration. The turnover time is the e-folding time needed for a sudden net increase in CO2 to decay back to normal. At equilibrium the total CO2 content of the atmosphere remains constant over decadal time scales. Currently though, as a result of our emissions, slightly more CO2 molecules are being absorbed than are being returned to the atmosphere. The atmosphere is therefore not quite in equilibrium with ‘natural’ life and the oceans. If you sum up all the sources and sinks then you find that about half man-made emissions are being absorbed each year. That means that only about half of the CO2 emitted by humans remains in the atmosphere. The strange thing is that this ratio hasn’t changed at all in 50 years, despite rapid increases in emissions. AR4 plot: The fraction of Anthropogenic CO2 retained in the atmosphere (b) is unchanged in 50 years, despite increasing emissions (a). Today we are emitting about twice as much carbon dioxide as we did 30 years ago, yet only half of it survives a full year. That means that currently, an amount of carbon dioxide equal to the total annual emissions of 30 years ago is being absorbed each year. Why is this and what does it mean? Part of the answer lies with the greening of the earth, but far more importantly the answer lies in how the oceans are responding. There is a ‘concentration effect’ acting on ocean sinks due to the increasing partial pressure of CO2 in the atmosphere. While we are still increasing emissions then levels will continue to rise. If instead we can stabilise emissions at some number of Gtons/year then CO2 levels would also stabilise, albeit at a higher level in the future. If we could cut emissions completely then levels would stabilise at a much lower level over a few hundred years. However, they would still not fall to pre-industrial levels for 100s of thousands of years. This is because of the so-called ‘long tail’ effect. So what exactly is going on and can we estimate what future levels will be? There are 3 independent Carbon cycles which in total must balance. 1. 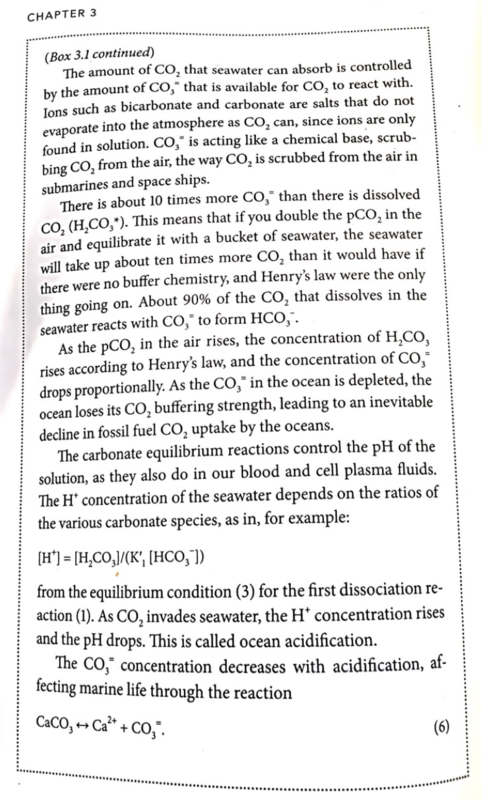 Dissolution/Absorption of CO2 at Ocean surfaces. Dissolution/Absorption of CO2 at Ocean surfaces. In stability there is a balance of CO2 Partial Pressures between the surface of the ocean and the atmosphere. At any given temperature the exchange of carbon dioxide molecules between the atmosphere and the ocean surface always reaches an equilibrium. This equilibrium is controlled by the partial pressure of CO2 in the atmosphere equalising to the partial pressure of CO2 in the surface of the ocean. Then the number of carbon dioxide molecules that escape from the sea surface is balanced by the number that enter the sea from the atmosphere. If the temperature of the ocean rises then the kinetic energy of the carbon dioxide molecules in the seawater increases and more carbon dioxide molecules will leave the ocean than would enter the ocean. This continues until the partial pressure of carbon dioxide in the atmosphere increases to balance the new pressure at the sea surface. If instead the ocean were to cool then the reverse of the above would happen, and CO2 levels would fall. Consequently carbon dioxide is more soluble in cold water than in warm water. This is Henry’s law. 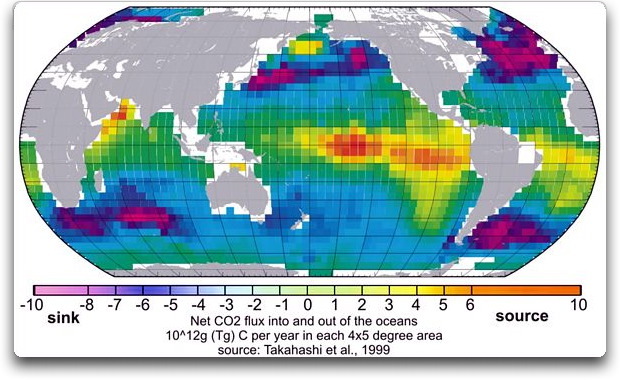 One consequence of this effect is that the oceans “inhale” carbon dioxide from the atmosphere into cold sea surfaces at high latitudes and “exhale” it from warm sea surfaces at low latitudes. Increasing the carbon dioxide concentration of the atmosphere therefore causes the oceans to take up (inhale) more carbon dioxide. Because the oceans surface layer mixes slowly with the deep ocean (hundreds of years) the increased carbon dioxide content of the surface ocean will be mixed very slowly into the large carbon reservoir of the deep ocean. 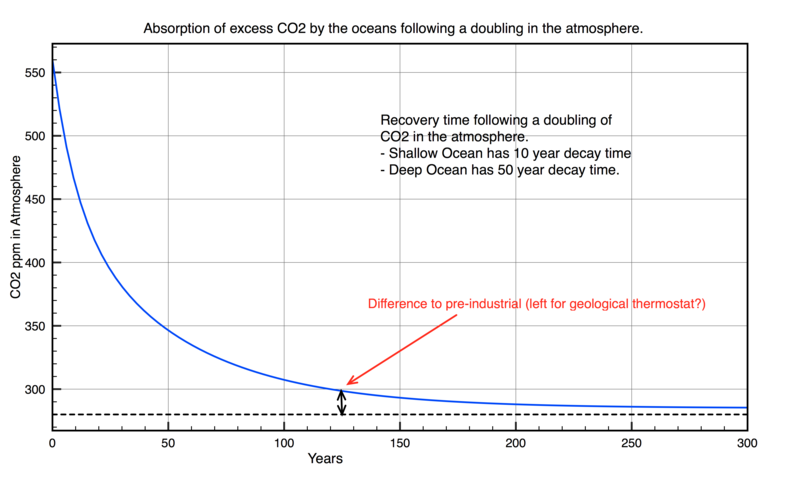 The rate of our adding carbon dioxide to the atmosphere is too fast for the deep ocean to be a significant reservoir. So as the carbon dioxide content of the atmosphere rises, so too does the concentration in the ocean surface. Cyanobacteria were the first organisms to develop photosynthesis. They evolved 2.5 billion years ago and quickly spread across the oceans, because they depend only on CO2, H2O and sunlight. They absorb CO2 and exhale oxygen. As they died and were fossilised into rocks so the oxygen levels in the atmosphere built up by an amount exactly equal to the organic carbon buried in rocks. Plants and trees depend on chloroplasts for photosynthesis, which evolved from symbiosis with Cyanobacteria. Animals could only evolve to eat plants and breath once oxygen levels became sufficiently high. Biogenic CO2 from dead organisms, mainly calcium carbonate shells, slowly gets buried over eons into sedimentary rocks, a tiny percentage of which ends up as fossil fuels. Peat deposition in wetlands also buries carbon vegetation which eventually ends up as coal. 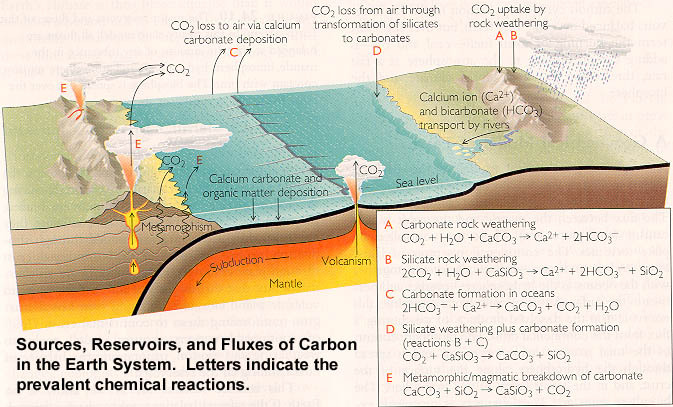 All these processes removes CO2 from the atmosphere and form the biological component of the geological cycle. The total mass of living plants and animals and carbon in soil, at any given time represents a temporary store of carbon. This is comparable to the mass of CO2 in the atmosphere. Life thrives in warmer climates with high CO2 levels and suffers during colder more arid glacial periods with low CO2 levels. Carbon dioxide in the atmosphere combines with water to produce weakly acidic rain. This acidic rain reacts with Igneous rocks to produce a set of ions and a weak acid. This is washed through soils down rivers to the sea where they react to produce opaline silicate and calcium carbonate. As a result CO2 is removed from the atmosphere. SiO2 and CaCO3 are insoluble and will settle to the ocean floor where they are moved by plate tectonics to subduction zones, carried deep into the Earth and heated converting them back into metamorphic rocks and releasing carbon dioxide. When these rocks and their associated carbon encounter Volcanic eruptions or Mid Ocean vents they return the CO2 to the atmosphere, thus ending the cycle. The rate of tectonic plate motions set the rate at which CO2 is released from the Earth’s interior to the atmosphere. If release from the earth’s interior exceeds the rate at which CO2 is removed from the ocean by the formation of calcium carbonate shells by oceanic biological processes, then carbon dioxide will accumulate in the atmosphere and visa versa. More CO2 leads to a warmer and wetter world which increases rock weathering, removing CO2 from the atmosphere and cooling down the planet again. This process has been proposed as the natural thermostat which kept the climate habitable for 4 billion years apart from a couple of excursions. It sounds like a good theory, but is it actually true? Why is it that 280ppm seems to be the set point for the thermostat? Just how confident are climate scientists that they really understand the carbon cycle? Can they, for example, explain why lower levels of CO2 occurred during ice ages? This is what AR5 says on the matter. AR5: All of the major drivers of the glacial-to-interglacial atmospheric CO2 changes (Figure 6.5) are likely to have already been identified. However, Earth System Models have been unable to reproduce the full magnitude of the glacial-to-interglacial CO2 changes. Significant uncertainties exist in glacial boundary conditions and on some of the primary controls on carbon storage in the ocean and in the land. These uncertainties prevent an unambiguous attribution of individual mechanisms as controllers of the low glacial CO2 concentrations. So the simple answer is no they don’t really understand the carbon cycle. Nor can they determine why CO2 levels in the atmosphere are naturally so low at <0.03%. A proper understanding of the carbon cycle should at least be able to determine why 280ppm is the natural level for today’s climate. I think this is the fundamental challenge for Carbon Cycle modellers. 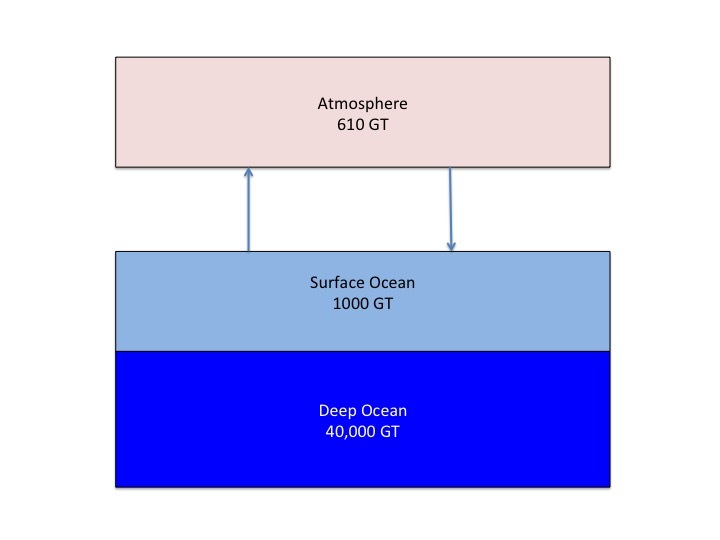 A stable CO2 level in the atmosphere is achieved once an equilibrium is reached between the ocean and the atmosphere, and this depends on temperature. Anthropogenic emissions must eventually reach such an equilibrium with the ocean and CO2 levels stop rising. This will result in some DT rise in global temperatures. The rock weathering thermostat presumably would then kick in to reduce CO2 levels back to ‘normal’ over several 100 thousands of years. However before then we would anyway have entered another series of ice ages with lower CO2 settings. Lets see if we can estimate what will happen in the future. We take two Carbon reservoirs of mass Y(Ocean) and and mass X(Atmosphere). We emit 2DX per year into the atmosphere X, of which half is retained and half is absorbed into the Ocean. Now consider a time when atmospheric levels have exactly doubled, after which all emissions stop. Then Atmosphere partial pressure = 2P(X), where P(X) is initial atmospheric pressure. P(Y+X) =P(Y)1610/1000 = 1.61 P(Y) = 450 ppm. All this means is that levels would quickly fall within ~10 years to 450ppm and then drop more slowly over the next ~300 years to 285ppm. This simple calculation is complicated slightly if the climate also warms by say 3C as a direct result of a doubling of CO2, but you can allow for that using Henry’s law. Since we are using CO2 levels rather than temperature, Henry’s law actually helps us. Taking a mean ocean temperature value of 13 C the solubility of CO2 actually increases by about 10% as temperatures falls. So levels actually fall slightly faster. My results totally disagree with the BERN model. The BERN model as described in AR4 predicts instead the following decay. 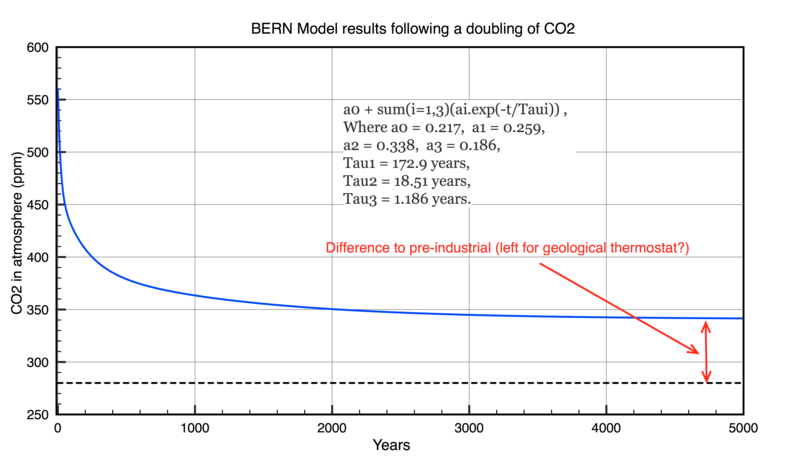 Bern Model calculation of CO2 levels following a doubling of CO2 in the atmosphere. In my opinion the BERN model has a logical flaw. It assumes that a fixed 22% of the Anthropogenic increase in CO2 will remain in the atmosphere for hundreds of thousands of years, waiting for geological weathering – but why would it? What possible justification is there to image that it is a fixed percentage, independent of amplitude? To illustrate my point, here is an analogy: Suppose I have a bath full of water with 3 holes in the bottom. The first hole is 10 cm wide, the second is 1cm wide, and the third is 1 micron wide. The water will all empty quickly, mostly through the large hole, some through the small hole and essentially ignore the 1 micron wide hole. However the BERN model says no this is wrong. More than 20% of the excess CO2 will sit around waiting hundreds of thousands of years to pass through the 1 micron hole, while ignoring the option of dissolving in the ocean! It is only when the partial pressures of carbon dioxide between the atmosphere and the ocean re-balances that a new ‘geological’ balance of CO2 can be reached. That happens rather fast and the net increase is small compared to glacial cycle variations, which as we have seen, climate scientists don’t yet understand. This entry was posted in AGW, Climate Change, climate science, Science and tagged CO2, IPCC. Bookmark the permalink. You mention two times: residence time and turnover time. You then define residence time and give it a value. One expects you will then define turnover time and perhaps give it a value also. Yet I don’t see it defined or given a value. Can you do so? Yes – you are right. I should define residence time. Basically it just means the time it takes for a sudden increase in net CO2 to decay by 1/e. Please read my question again. It’s the TURNOVER time you failed to define or provide a value. Sorry I only now got around to reading your response. I think I have figured out where the BERN model and others like it get their non-linear diffusion from. You start with a CO2-water system. This system is always acidic. At 400 ppmv CO2, the pH is around 5.8. What’s interesting about this system is the extraordinary re-distribution of carbonate ions that happens if you add sodium hydroxide to it. If a gas dissolves equally into two species, A and B, and A can emit a gas molecule any time, while B cannot, the rate of emission remains constant only so long as the two species A and B are in equal proportion. If, after adding acid or base, species A becomes more common than B, the rate of emission will increase without any change in total dissolved concentration. Now, the CO2-water system is always acidic, but if you were to add OH- to it, and raise its pH to 8.0, the ionic balance between the carbonate species changes dramatically, and the system operates in a regime where increasing CO2 partial pressure does not lead to proportional increase in the dissolved concentration. I have more details and a reference in an update at the post below if you are interested, but I will summarize below for the benefit of your readers. The Revelle Factor talked about in climate science works like this: if you double the partial pressure of CO2 in the OH-CO2-water model, you increase the concentration of CO2 in the water only by 2/R, where R is the Revelle Factor. The Revelle Factor for an OH-CO2-water system with pH = 8.0 is around 10. If you model the ocean as a saturated solution of calcium carbonate, CaCO3, with CO2 in the atmosphere above at 400 ppmv, you get a pH of 8.5, which is close to the ocean’s 8.2 without addition of any unrealistic acids or bases. In the CaCO3-CO2-water system, there is no re-distribution of ionic concentrations for the range 100-10,000 ppmv CO2. The dissolved CO2 increases in proportion to atmospheric concentration. The top layer of the ocean is almost saturated with CaCO3, so this model is a good one. The non-linear behavior of the BERN model comes, so far as I can tell, from an implementation of the Revelle Factor for an OH-CO2-water ocean model. If they were to use the more natural CaCO3-CO2-water model, the system would be linear and, by the superposition principle of linear models, the entire response of the system is given to us by the carbon-14 impulse response after the bomb test ban. But they use the OH-CO2-water model, and now there is a difference between the average time a certain carbon atom is in the atmosphere (residence time, I think you are calling it) and the time it takes for the system to adjust to a 600 GT impulse of carbon-12 to the atmosphere. So they have “adjustment time” for their non-linear system, and lecture you on how this is not the same as “residence time”. Can you see any reason to use an OH-CO2-water model instead of a CaCO3-CO2-water model? Thanks for this insight. I need to go into this whole subject more deeply to make an intelligent comment. I am sure that the BERN group are making assumptions about future saturation of sinks which may well be unjustified. My gut feeling is that if emissions of CO2 stabilise then so too will atmospheric CO2 levels. Sources and sinks always must balance as they always have done in the past. There is evidence that the growth in emissions is stabilising. Interesting. Chemistry is by no means a forte for me. Are these statements based on inorganic considerations only? Also, the statements appear to be for a static ocean. Cold, CO2 rich deep waters which rise and warm will remain a source of CO2. That doesn’t distinguish between land and ocean of course, and is from continuous emissions, not a pulse. But I just can’t get to declining uptake from observations that indicate increasing uptake. There are so-called upwelling areas off continental coasts where cold deep water is pumped to the surface by ‘Ekman’ transport. caused by winds blowing parallel to the coast. These are also the world’s most fertile fishing areas because the cold deep water is rich in nutrients. Examples are California and Western Africa. This must replenish ph and stop surface sinks saturating. So far as I can tell, Archer’s description is inconsistent with the calculated ionic concentrations in a saturated solution of CaCO3 in water with CO2 in the air above. See figure 5.6 here for the ionic concentrations for such a system with increasing partial pressure of CO2 (pCO2). For pCO2 1 ppm to 1 atmosphere (log concentration -6 to 0), the concentration of HCO3- increases linearly, with half the increase being due to dissolving CO2 and the other half due to dissolving CaCO3. At 400 ppm, the log of H+ concentration is around -8.5, making the pH 8.5, which is a good match with the ocean’s 8.2. According to a few papers I have skimmed, the top layer of the ocean appears to be saturated with CaCO3. To mimic seawater with CO2 in a bucket, we would have to put some CaCO3 solid in the bottom of the bucket of seawater. Such a system obeys Henry’s law for dissolved CO2 mass versus pCO2. I think Archer is modeling sea-water as a CO2-water only system, in which all the CO3-2 ions come from dissolved CO2. In that system, the ionic balance does do strange things at pH=8.5, but that pH is not possible with only CO2 and water, a mixture which is always acidic. At 400 ppm CO2 in the atmosphere, such a system has pH = 5.8 (see Figure 5.4 in my reference). If you add NaOH to make the pH 8.5 in artificially, you can say that dramatic changes in the ratios of the carbonate species will take place as pCO2 increases, and it is this model of seawater that gives rise to the “Revelle Factor of 10”, where the ocean absorbs 10 times less CO2 than we would expect from Henry’s Law. I agree with you. It’s clear from your graph that absorption rate is increasing with pCO2 in the atmosphere. The PETM released >2000 GT of carbon 50 million years ago which is at least four times greater than what man has released. It recovered within 100,000 years. 100,000 years is a long time. I claim the carbon system would reach a new equilibrium within 50 years. I have been looking, along with a friend, for a paper that describes and experiment in which we take seawater, increase pCO2 above it, and measure the increase in dissolved CO2 mass. I have not found one yet. Surely one exists. My friend found this one, which measures the CaCO3 content of seawater. Aside from people like Archer claiming that seawater and CO2 behaves non-linearly, have you found any experimental evidence of such non-linearity? I have searched for large scale experimental evidence for the BERN model. I can only find mickey mouse experiments with beakers of water for school science lessons. To add to my problems with your non-definition of “turnover” time (see first comment above), you then introduce a model with two “decay” times (10 years for the shallow ocean, 50 years for the deep ocean). The curve looks rather like an exponential–can you supply the equation? (e.g., Ae^(-t/tau1) + Be^(-t/tau2). Is the 10 years the “residence” time (in which case it is pretty close to the C-14 residence time) and the 50 years the “turnover” time? You’re right. I took the term ‘turnover time’ from the book of David Archer ‘The Global Carbon Cycle’. It refers to the decay time of a sudden net increase in atmospheric CO2 (doubling) to return to previous levels. The ‘residence time’ is the average lifetime of a Carbon 14 CO2 molecule (or any other) before it is absorbed in a sink. 2) what is more realistic is that emissions stabilise at some fixed level say 2GT/year. I am sure that in this case too CO2 levels will stabilise at some higher level. I just have not yet found the time to calculate it ! What I offer here is not related to your latest article but it does add some more to your lunar cycle influence that you have proposed. As you know I have been able to find evidence of an 18.6-year cycle in various measurements but I really got surprised today. The inspiration for this new effort comes from GWPF. Therein they were dealing with land only anomalies. I decided to download the UAH version of the land only anomalies. At first, since the data looked very much like the global measurements of both land and water I started with the cyclic fit that I use for that dataset and then let the adjustments be made. I ended up with a resulting correlation coefficient that is below what I normally expect. I then decided to check again but this time I would do a fresh OFT of the raw data. Two things surprised me. First, the 65-year cycle had never shown up in the satellite records and second, an 18.3-year cycle also showed up. In typical fashion, I use the results of the OFT as inputs when I do my fit analysis. The two cycles were preserved when I did the fit analysis but I ended up with a third surprise and that is a very prominent cycle at 37.75 years. Is it possible that this could be a harmonic of the 18.6-year cycle? I think the fit is good. The ECS value is now close to what I get when I analyze the much longer H4 data. For the H4 data the ECS is found to be 0.227. BTW, the correlation coefficient for the OFT by itself was 0.78. Usually, the cyclic fit I go through improves the correlation value. That potential harmonic of the 18.6-year cycle is, indeed, prominent. Just to see if redoing the OFT of the full global would show anything similar I did that again too. The first column is the frequency followed by the period, amplitude and phase. In my judgment, the three cycles are not there. It would sure be nice to have an explanation for this. Clive, I have had other questions on these data that I would love to have answers for. Previously, I have noted that there was a strong El Nino in 1982 that was close to the value in 97-98. Yet, look at the figures here. It really is not identifiable. It has been my impression that El Nino shows up more prominently in that satellite records than it does in H4. I hope this helps you in some way. Is this real and is there an explanation for this. The 18.6y lunar cycle has the largest effect on the distribution of tides with latitude. Charles Keeling (of Mao Loa CO2 fame) has proposed that this cycle can explain decadal variations in global surface temperatures . Proc. Natl. Acad. Sci, 94 p 8312-8328 Aug 1995. So yes it is not surprising that you find such a signal!